(Cave of the Crystal Sepulchre), also locally known as ATM or Xibalba, is an archaeological site that includes skeletons, ceramics, and stoneware. There are several areas of skeletal remains in the main chamber. The best-known is “The Crystal Maiden”, the skeleton of a teenage girl, possibly a sacrifice victim, whose bones have been calcified to a sparkling, crystallized appearance. The ceramics at the site are significant partly because they are marked with “kill holes”, which indicates they were used for ceremonial purposes. Many of the Maya artifacts and remains are completely calcified to the cave floor. 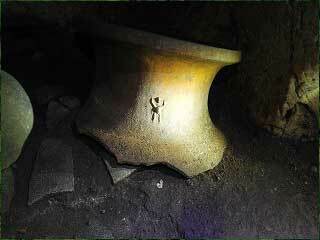 One artifact named the “Monkey Pot” is one of just four found in Central America. The Maya also modified cave formations here, in some instances to create altars for the offerings, in others to create silhouettes of faces and animals, or to project a shadow image into the cave. The cave is extensively decorated with cave formations in the upper passages. You start the day with an hour drive, leaving San Ignacio, east for a half hour on the Western Highway and southeast off road for another half hour towards the Tapir Mountain Reserve. At the bush line we leave our vehicle and gear up for a 45 minute jungle hike through the subtropical forest of the reserve. Hiking through the reserve (6741 acres) you may see some of Belize’s amazing wildlife, as this area is home to the Tapir, Jaguar, Howler Monkey, Silky Anteater, White Tail Deer, etc. A hearty healthy lunch is followed by an introduction to the cave and the Maya. After gearing up with professional cave helmets, lights and waterproof bags, then you venture to explore the underworld of the Maya. At the cave entrance there will be a short swim through crystal cave water, into passages filled with cave formations. Through the passages you learn about cave geology, as you encounter stalactites and stalagmites. You then follow the flowstone that leads into a hidden dry chamber. Here you start the tour of the Maya rituals and ceremonies, explore the remnants left and evidence of their activities. Our headlights help reveal hundreds of ancient Maya artifacts that were used in various ceremonies. You reach a breathtaking scene at the end of the cave. From here you make your way out of the main chamber and through the jungle tour vehicle back again to the town of San Ignacio. 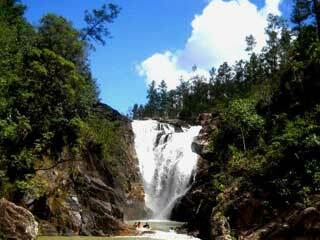 It is a part of a large river system, which is the largest subterranean site in Belize. Mayan cultural remains has been found less than half mile from the entrance of the cave. The cave consists of ten ledges with the first starting at the mouth of the cave and stretches for 30 meters beyond the bridge that was built by the Mayas of Belize. Book a trip with us to experience this trip and for indebted information on this beautiful cave once use by our Mayan. You start off from The Log Cab Inn, then into San Ignacio with an hour drive through farmland where you can see the Mennonite in their traditional life style. We reach Barton Creek, which is a large river passage over 4.5 miles long navigable by open canoe. At the large entrance of the creek cave you board the canoes, switch your lights on and slowly paddle your way into the cave passage. While floating deeper into the passage you will learn of the geology, archeology and Maya history of this passage, as your lamps bring to life crystal formations that are a few million years old. After exploring this passage you turn your canoes around and float back out. You then park your canoes at the entrance of the cave and complete your half-day tour with a swim in crystal clear water. The Belize Zoo was established in 1983 to display local wildlife of the Country. The Education Research Center was established that same year. The zoo has a wide range of wildlife from birds, small rodents, snakes and small animals of our forest with the tapir being the largest animal roaming wild in the Belizean rainforest. The perfect way to know about Belize is stop at the zoo on arrival. This way you will familiarize yourself with our wildlife especially since we have some deadly species of snakes. It was excavated in the 1950, after the visit by Linton Satterthwaite from the University of Pennsylvania. At the time of the excavation the crew recovered 32 monument stones, 2 causeways and 5 ball courts. During 1953 to 1994, Satterthwaite and Anderson mapped the central area of the site and continue their excavation. Trent University investigated in 1978 to 1979 the agricultural terraces. It wasn’t until 1985 that project of Caracol really initiated. However it was between 1989 and 1995 that intensive excavations were undertaken on the monumental and residential architecture on the site’s epicenter. The day starts off departing The Log Cab-Inn in San Ignacio. We set off at 7:15 a.m., driving through the Mountain Pine Ridge Reserve, moving into subtropical rainforest where wildlife is abundant. One hour drive to Caracol is the largest Maya site in Belize, covering 30 square miles of thick, high canopy forest and comprises a Classic-period complex that includes a number of pyramids, five plazas and an astronomical observatory. 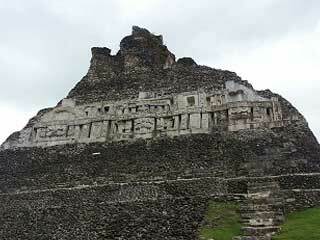 It is estimated that 1 million or more people lived in this area as the city – state peak around 700 A.D. Over 35, 000 buildings have been identified with the loftiest pyramid reaching 139 feet, Belize’s second tallest building. 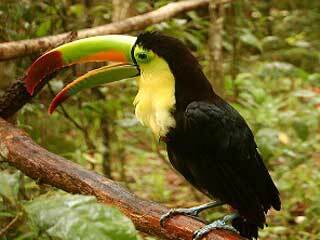 There is a strong possibility of sighting a Jaguar, Tapir or any of Belize’s amazing wildlife. 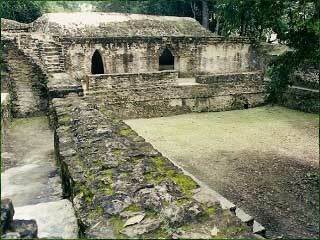 Upon reaching the site of Caracol, you will receive a guided tour where you will learn about the ancient Maya. After touring the excavated portion of the site, we have a hearty healthy lunch at one of the picnic sheds provided by the park. We then make our way back through the Mountain Pine Ridge where, if time permits, we stop at the Rio on Pools for a refreshing swim. From here we return to San Ignacio. 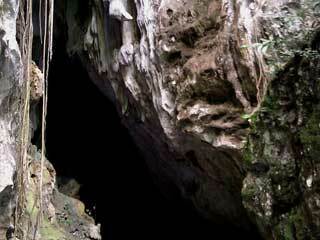 Inside the cave’s passages, you will learn of the geology and Maya history of these limestone caves. After floating through the first and second cave of slow running water, the current speeds up as we float over small rapids. You then set off into the third and final which is also the most active cave of the three. 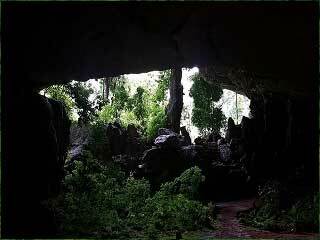 It is where you can see more cave formations and also a few bat species. Departing from The Log Cab Inn in San Ignacio, you make your way on to the Western Highway (11/2 hrs. drive) Caves Branch System. You gear up with inner tubes, lights and waterproof bags. After a 45 minute hike through semi-jungle/local farmland, you get to one of the many cave entrances and passages that make up the Caves Branch System. You hop in the water with your inner tubes to start a 2 hour cave tour, floating down stream through cave passages. This part of the tour is optional – you then make your way to the Belize Zoo to observe and learn about the amazing native wildlife of Belize. The zoo is special: it is as if the animals are in their natural habitat. After spending the last two hours of the day at the Belize Zoo you head back to San Ignacio completing a full day tour. A dry cave located in the Maya Mountain range of the Cayo District, Che Chem Ha is one of Belize’s premier caves to visit. Set high on the plateau of the ancient Macal River valley, Che Chem Ha offers a unique experience to the archaeological fanatic. Ancient altars, ceremonial rooms and artifacts undisturbed for the last 2000 years can be seen left behind by the Mayas that once occupied these sacred places. There is a mix of activities: hiking, caving and sightseeing. You hike through the jungle to the entry of the cave that was used by the Maya as a storehouse for grain as well as a ceremonial center for their after-life, bloodletting rituals. 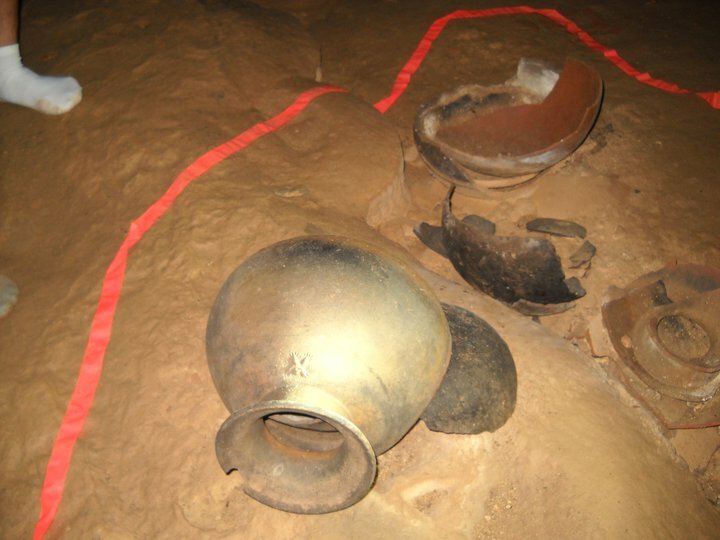 The different levels of the cave contain numerous pristine artifacts, including large pottery vessels, some with painting and other distinct markings. One of the Chambers contains artifacts used in performing their ritualized ceremonies. Located on a hill overlooking San Ignacio town was once residence for royalty. The center consists of 34 structures compacted in a small area slightly more than 2 acres. With the majority located around 7 courtyards and include temple pyramids and several long-range, residential-type buildings. The tallest temple stands 77 ft high. Site also has 2 ball courts, 5 plain stelae, 1 altar and a sweat house. A New visitors’ center contains artifacts and a reconstructed model of the site. This is a full day activity you will visit the Rio Frio Cave, Rio On Pools, and Hidden Valley Falls. Rio Frio Cave – Boasts an amazing 65 ft high entrance and an exit just as high. A stream flows through the cave forming pools and falls at various points. In the center there is a large welcoming beach area surrounded by huge boulders. There are scenic nature trails just after you exit this cave. Rio on Pools are made up of a series of pools formed by large granite boulders and are connected by small waterfalls. This is a popular spot for swimming and picnic lunches. Hidden Valley Falls or Thousand-Foot Falls is believed to be the highest waterfall in Central America and is actually over 1, 000 ft to the bottom. A viewing platform overlooks the falls for a breathtaking view of the pine engrossed valley. Ride across a hand cranked ferry to explore this site. Its Classic period ceremonial center that occupies 325 sq. yards with elite, middle and working class residential structures laid out a few miles into the surroundings. Now extensively restored, with El Castillo as its tallest building rising at an impressive height of 131ft out of the jungle. It gets a lot of attention for its stucco frieze that has an astronomic theme, glyphs for the sun god, moon god and planet Venus. Stunning view of 3 villages from atop this pyramid. Now there is a museum displaying steles and other findings. Just a two hour drive from Log Cab-Inn. 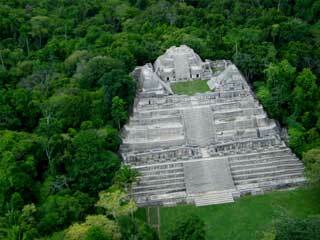 It sits in the department of Peten in Guatemala where its towering pyramids rise above the thick jungle canopy . 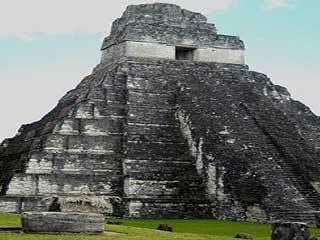 The ancient Maya began building Tikal around 600 B.C. and came to its peak after some 1, 500 years, home to an estimated 100, 000 Maya it became one of the greatest centers of Maya culture and sprawled over 46 square miles with more than 3, 000 structures in the core city center alone. It was an important religious, scientific, and political center. Pyramids to honor dead kings were built, administrative buildings rose, storage houses appeared and houses for royalty were carved out of the jungle. Today, the pristine forest engulfing the ruined city is home to howler and spider monkeys, white lipped peccary, brocket deer, gray foxes, coati-mundis, toucans, scarlet macaws, parrots, ocelots and the seldom seen jaguar.